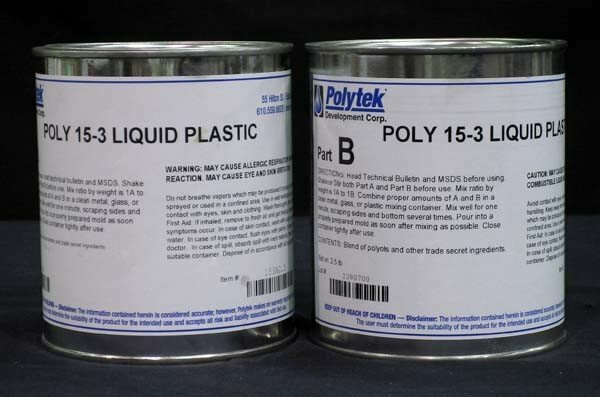 Poly 15-3 Liquid Plastic is a 1A:1B mix, filled polyurethane liquid casting plastic that has a 15-minute pour time and a 12-hour demold time. It is great for casting decorative objects, production parts, tools, models, patterns, fixtures, duplicate masters, and more. 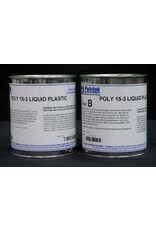 Poly 15-3 cures to a rigid plastic with a dense stone-like feel, making it ideal for backfilling cold cast bronze parts. The filler makes Poly 15-3 a very economical, low-cost resin and also reduces exotherm so shrinkage is minimal (0.0002 in/in); Poly 15-3 and Poly 15-3X exhibit the least shrinkage on cure compared to other Polytek polyurethane plastics.